Did you know that many of our senior caregivers at Wilson Care didn’t originally have intentions of going into that career? But, in some way another, they realized that their unique combination of skills could be put to good use in helping the elderly. At Wilson Care, we’re always looking for qualified candidates for our CNA jobs. But one of the questions we hear the most is “what are a caregiver’s duties?” It’s a pretty simple question, but it’s a good one! 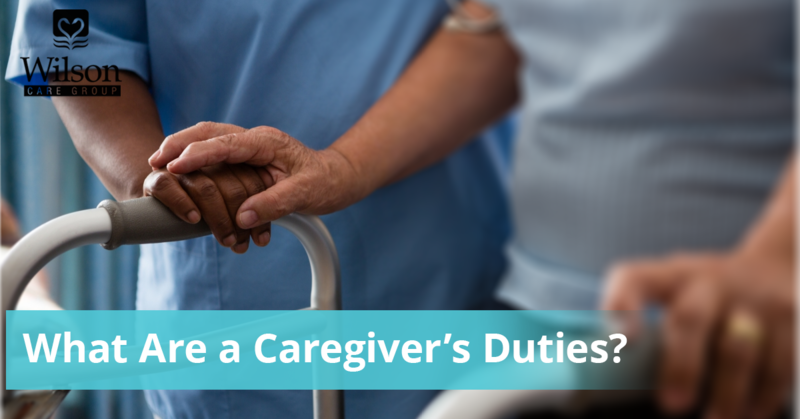 In this blog post, we’ll take a look at the main duties that a caregiver provides. If these are skills that you naturally possess, we hope you’ll consider applying for one of our caregiver jobs for our Honolulu living center, or for the seniors who receive in-home care! This is arguably the most “stereotypical” role of a caregiver, one that always pops into people’s heads when they think of the position. Yes, it is true that, as a senior caregiver, one of your duties will be to oversee the personal care and hygiene of the elderly whom you serve. We won’t sugarcoat it — this goes beyond the comfort zones for many people, as there are certain patients who need help with intimate personal care tasks, such as bathing and using the toilet. But if you’re okay with the idea of assisting with these types of things, you’ll find that it’s very rewarding being such a help to the seniors that you’re working with. And, of course, that’s not the only thing you do. In fact, the majority of patients can meet their basic hygiene and care needs, so it’s not something you’ll be doing all the time. But if you’re considering working with seniors, it’s important that you’re empathetic, patient, and kind. It can be taxing helping people with physical tasks that are trivial for younger, healthier bodies, so we look for people that will always maintain a positive, helpful, and loving demeanor. While helping seniors with personal hygiene and care is undoubtedly important, it’s secondary to the essential task of overseeing the general health of your senior patients. At an elderly age, it’s only natural to require medicine for any number of physical maladies. For some seniors, the medications that they’re prescribed are a source of comfort, such as easing pain or helping them to sleep. For others, there are medications which are literally keeping them alive, and failure to take them could result in catastrophic consequences. So, as a senior caregiver, one of your most important tasks is ensuring that your patients take their medication. Sounds easy, right? Not so fast — prescriptions can add up quickly in advanced age, and it’s not uncommon for certain seniors to have over a dozen different pills, capsules, or tablets that they need to take. Some might need to be taken once a week, others twice a day. Some might need to be taken with food, while others might suppress their appetite for the day. It suffices to say that keeping up with all these medications, and ensuring that they’re taken at the appropriate time, is not a trivial task. It requires someone who has a strong sense of organization, a peculiar attention to detail, and a sense of urgency, as caretakers are often responsible for renewing prescriptions and picking them up. Is pristine organization a natural talent of yours? Have you always had a knack for planning your weeks out in advance, creating schedules, and sticking to them with discipline? Not everyone has these talents, and you could be getting paid for them if you apply for one of our CNA jobs! Seniors, unfortunately, don’t have the luxury of being cavalier with their food choices like many young people do. In reality, everyone should be eating healthy, but seniors are the ones who are punished the hardest for poor nutritional choices. Not only do short-term consequences hit them harder, but many of them are also now dealing with the long-term effects of unhealthy eating over multiple decades. In short, this means that a caregiver can’t afford to let their patients eat garbage. So, it’s up to you to take charge of their nutritional situation. Not only will you help prepare food for seniors, you’ll also take part in forming their diet, shopping for ingredients, and creating a plan that works in harmony with their various medications and eating schedule. Are you the type of person who’s always had a natural touch for the culinary arts? We’re not asking for five-star chefs, but the better you are with food and nutrition, the more you’ll be able to help seniors who have a real need for a quality diet! This can also have benefits for you as well — in studying how to feed elderly seniors who rely on healthy food, you’ll learn so much about how to apply the same principles to your own life. There are many seniors who just aren’t fit to drive anymore. It could be because of their eyesight, their mobility, their mental health, or any other number of reasons. But that doesn’t mean they have any less desire to get out! As a senior home caregiver, one way that you can bless the lives of your patients is to provide transportation for them. There may be social events they want to go to, a movie they want to see, or they might simply want to sit in a pretty spot somewhere outside. Naturally, there are also mandatory trips you’ll need to take, such as bringing them to their medical appointments and allowing them to tend to essential errands. Finally, one of the best things you can do for a senior is just helping them to keep their living space clean. A good senior caregiver will have good skills in keeping a house clean, and knowing simple repair jobs can be a boon in case something goes wrong with an appliance. It’s not like we need a full-service handyman, but it’s immeasurably helpful for seniors to have people around that can handle the dishes, sweep their floor, do their laundry, and any other number of household tasks. As part of this service, you can also provide the added benefit of keeping company to your elderly patients. Life can be lonely for many of these folks, and you can bet that they appreciate the time you spend with them. And hey, you might just be surprised to find how much you can learn from them. Are you a highly organized person? Have you developed habits throughout your life of preparing healthy food and staying on top of your nutritional needs? Are you a great housekeeper and cleaner? Do you have a driving record that anybody would be envious of? In normal circumstances, this unique combination of skills might not seem like an obvious toolkit for employment, but as it turns out, it’s perfect for a caregiver job! These caregiver duties are skills that not everyone possesses. Are you interested in serving the elderly and bringing joy to their lives? Apply for a CNA job today, and be sure to contact us if you have any questions!